Any advice on Cowan and Celadon lease purchase? Is it worth it? I’ve been driving for the past four years and for the past 3 years I’ve been a local driver in Alabama but my family and I are moving to Georgia this summer. Will I have trouble a Georgia job before I officially get there or will I have to live there for a certain period of time before applying for a job? Backup cameras... Yes? No? Maybe? Where would you install the camera when you're constantly swapping trailers? I`m on the fence with this one. I guess if I explained the situation and they came through with some common sense, I would be cool with it. It seems they just do not know, otherwise, they would have taken the more cost (and driver) friendly option. Ooooohhh!! One other thought I forgot. Think of all the brownie points you are earning now. I would bet dollars to doughnuts once you talk to your dispatcher about the whole situation. He will probably say to himself. Man I am going to owe this guy big. I didn't look at it that way. I'm gonna have to do that! Thanks man! I would have been on the phone a long time ago to the Fleet Operations Manager or what ever the title is for the Dispatcher's Supervisor. This situation is beyond the pale IMHO. Here's an update. The tractor won't be ready until possibly Monday so my dispatcher sent me home via Greyhound which will take 20hrs just to bring me back on another 20hr Greyhound ride on Monday which means I'll get there Tuesday to hopefully get a load to deliver on Christmas Eve so I can see my kids open their gifts on Christmas. Why they're sending me home over the weekend I do not understand but my dispatcher said he was told to do that instead of paying for motels again. This is becoming too much. In that case I would have told them no way. It's not likely they realize you'll spend 40 hours on a bus doing that. They're probably trying to be nice and get you to the house - that's what most people would want. But I agree with you - that's waaaaaaaay too long to be sitting on a bus for a day or two at home. Unfortunately hotel room prices have to be through the roof this time of year I would imagine, but that's not the point of course. Yeah Brett the (5 star) Rodeway Inn they had me in was $49.99 a night which would've been $100.00 over the weekend, instead they spent $167.00 on a Greyhound ticket and I had to spend $110.00 on a cab ride. That's $275.00 spent on cab fare in a week alone & to think they want me to cone back on Monday and do it all over again? No way! I'm humble, hard working, and hardly ever complain, and will pay my dues in this industry as expected but I'm not gonna go on wild goose chases for the fun of it. The only way I'm going back there to get that truck is if one of our drivers is going that way and he personally drops me off, but no to the Greyhound and H no to the cab! Anyone ever had a high pressure sensor or pump go out? That's what's wrong with the truck I was in. Dispatch asked me how was I holding up. I told him my friends been keeping me company, he said oh I didn't know you had friends in Joliet, I said I don't! I was referring to the ones on Trucking Truth! Thanks again!! That's too good. Keep strong. Here is something to make you smile. A truck driver stopped at a roadside diner for lunch and ordered a cheeseburger, coffee and a slice of apple pie. As he was about to eat, three bikers walked in. "He's not much of a driver, either," the waitress replied. "He just backed his 18-wheeler over three of your motorcycles." Lol!!!!!!!! I needed that one!! DeJuan, I guess you know I'm with Knight, and I'm out of the Gulfport, MS terminal. I know you are new at this, but I'll tell you that my DM throws extra money at me all the time - he'll pay me for three stops when I only had two, or he'll put a double tarp pay on me when I really only had to tarp the load once, and they are always fair about breakdown pay. Some of this stuff won't happen until they know you are a dependable employee that knows how to get things done, but you do that and they will take care of you. Just hang in there and keep a great attitude - I promise you they love that. I know it seems crazy to you, and to many of the others that have heard your tale, but it is just not that unusual for a new solo driver to be asked to go recover one of these abandoned trucks like this. Sometimes they are so nasty inside that you'd think the best thing to do with it is pour about five gallons of gas on it and throw a match to it. 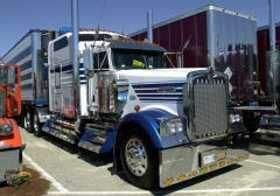 The other thing that happened to you that is very common in these large trucking companies is that the right hand seldom seems to know what the left hand is doing. Crazy isn't it how they had you go get a truck that the mechanic has been saying isn't fit to drive. Stuff like this happens fairly often in these trucking companies. Some dispatcher in a different terminal sees on his computer screen where a truck is sitting and all he can tell from the notes is that it is sitting idle and needs a driver in it so he sends a new driver to go get it. Then it starts to develop into a scenario like you are experiencing. Trust me on this one thing though, it does not mean that this is a bad company. Just hang tough and it will all be righted in a relatively short time and they will have you rolling down the highway in a truck that will serve you well. Your wisdom hasn't let me down yet!! Boom! There you go, small victory! Just trying to help you turn lemons to lemonade here but sounds like as bad as this start is you may have got lucky with putting somewhat of a "favor" in your back pocket right out of the shoot! Advantage DeJuan J.! Are you going to get breakdown pay? Did your DM say anything about getting you in a different truck? Dang dude, straight into the fire! Don`t sweat any of this. Keep all of your receipts and definitely check into the 24 hr thing for breakdown pay. My company starts it after 2 hrs (4 if doing a PM). Keep a good attitude at all times toward your DM, the mechanics and other drivers at the terminals (you never know who you may be talking to). It will pay off.